Savant 131DDA SpeedVac Kits are reliable, versatile and can be used with a wide variety of solvents. Savant 131DDA SpeedVac Kits are reliable, versatile and can be used with a wide variety of solvents. Solvents and solvent combinations for the SPD131DDA P1 include acetic acid, ammonium hydroxide, fromic acid, TFA, methylene chloride and TFA, acetone and HCL, methylene chloride and MEOH and DMSO and methanol. Solvents and solvent combinations for the SPD131DDA P2 include DMSO, DMF and toluene. The SPD131DDA kits offer resistance to TFA, DSMO and other aggressive solvents used in combinatorial chemistry applications. The SPD131DDA P1 is typically used in solid phase extractions, drying lipid extracts, flask chromatography fractions and solid phase synthesis cleavage solutions such as protein hydrolyzates and evaporating synthesis solids. 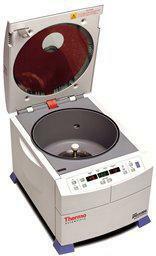 The SPD131DDA P2 is typically used in compound management and evaporating dissolution solvents. Both Savant SPD131DDA SpeedVac kits feature a deep aluminum PTFE coated chamber, a safety cover lock and a radiant glass safety cover that improves drying time by applying radiant IR heat to samples. Additional features include PTFE plumbing and tubing, two valve manifold with built-in automatic bleeder valve, time/temperature display incorporating membrane touch pad switches, time/vacuum run, variable drying times from 35° C to 80° C in five degree increments, manual/auto timed run, endpoint mode that terminates run when pre-set vacuum level is reached, built-in vacuum gauge and vacuum display, radiant lamps within the chamber, heated lid for processing high boiling solvents (DMSO, DMF), wider vapor port and tubing for enhanced vapor throughput – reducing drying times, adjustable vacuum level for preventing bumping of difficult solvent mixtures and optimizing drying times, -5°C trap specifically designed for trapping high boiling point solvents and standard glass safety lids. Ordering information: The Savant SPD131DDA P1 SpeedVac Kit includes acid resistant SpeedVac concentrator, -105°C, ultra-low temperature refrigerated vapor trap, OFP400 oil free, ETFE/PFA four-headed pump, rotor (RH40-12) for 40 12 x 75 mm glass tubes, glass condensation flask, CryoCool heat transfer fluid (1 L), tubing and fitting kit including 4' of clear, thick-walled vacuum tubing, two clamps and a cutter. 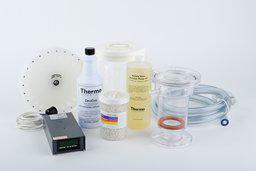 The Savant SPD131DDA P2 SpeedVac Kit includes basic molecular biology SpeedVac concentrator, -5°C refrigerated vapor trap, vacuum pump, rotor (RH24-15) for 15 15 x 45 mm 1 dram vials, chemical trap kit for use with disposable cartridge, disposable cartridge with color indicator for trapping acids and water vapor, tubing and fitting kit including 4' of clear, thick-walled vacuum tubing, two clamps and a cutter, glass condensation flask, CryoCool heat transfer fluid (1 L) and vacuum pump lubricating oil.